Toms house cleaning services Melbourne proffer the best of professional cleaning services like upholstery cleaning, curtain cleaning, tile and grout cleaning, carpet cleaning, ducted heating cleaning, etc. 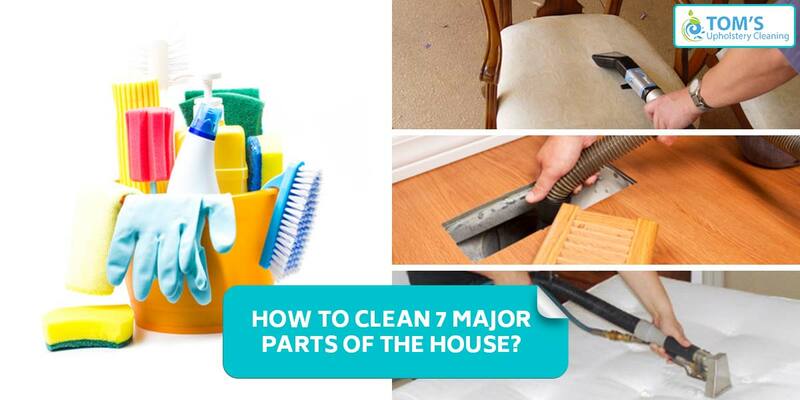 Here our professionals have laid out the best and quick ways to get major parts of your house cleaning. First of all get clear of all the clutter. Start from one corner of your living or dining room and work around dusting all the surfaces. Dust the blinds and verticals that come along the way too. Use an upholstery attachment and vacuum furniture upholstery Do not forget dining chair cleaning done. In the end vacuum up all the loose dust from the floor. Use a vacuum or call a upholstery cleaning professional for sofa cleaning and couch cleaning. Related Article: How To Clean Your Sofa without Vacuum Cleaner? If you have a dishwasher load all the dirty dishes in the dishwasher. You have a stove top that can be removed, place them in the water as well. You will have to use a sponge for this one. Dunk the piece of sponge in hot water and squeeze out the excess. Use hard detergent in the water. Wipe down chests, tables, counters, cabinets and other surfaces. Make sure you go from top to bottom as if you’d’ start your way up from bottom, the water will drip and make the lower parts dirty again. Use another sponge dunked in warm water. Finally wipe it off with a clean cotton cloth. Related Article: How to Clean Upholstered Dining Chairs? The bed sheets and carpets that we live on every day will be filled with dead skin cells & our sweat, this makes the carpet and bed sheets very hospitable for germs, lice and bacteria. A certain microbiologist from the University of East Anglia recommends to wash bed sheets with hot water at least once a week, using hot water with a temperature of 60 degrees Celsius. You can also vacuum them every other night and use disinfectant for fabrics too. Wooden floors do give a lovely and natural appearance to our dwelling. But do you know, wood floors are very vulnerable to damage because of moisture. To clean it up sweep the floor every day with a fluffy (big) broom. You can also use vacuum. Use a dry duster to remove the loose dust. Use commercially available wood floor cleaners. For vitrified tiles, stones or any other fiber flooring use floor cleaner with water and mop it all up after having broomed. AC that has not been serviced can make bad air in our house. Well, some air conditioners now make it easier for us to open the filter by hand, without the need for equipment. To clean the filter, use a wet wipe or vacuum cleaner. It’s very simple and you can save on maintenance costs. Get a long broom, If you don’t have on get another stick attached with it. You can also use a vacuum with an attachment. Clean off the floors as required.